July 1st and 2nd 2007. The two-day small-scale event ‘Hotel New York. Inquiry in Location’ is an outcome of a collaboration between the three authors, inspired by the workshop ‘Art and Remote Locations’, a project with Tracey Warr, and supported by Piet Zwart Institute. 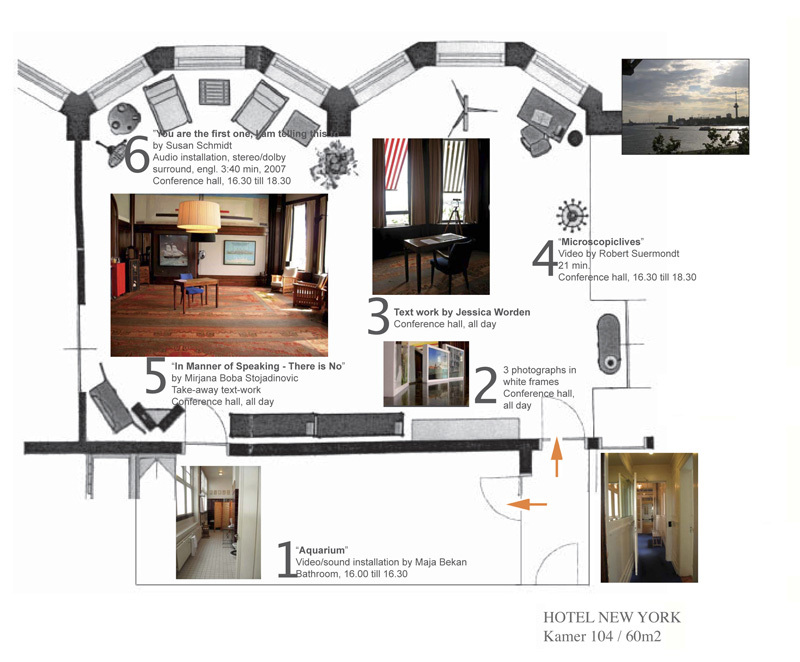 The relation towards the ‘remote’ and presentation as such made us take into consideration the conference rooms of Hotel New York (many thanks to Reinaart Vanhoe for the suggestion). HNY introduced to us the nuances of the historical transformation of the notion of moving, travelling, emigrating, escaping, perhaps back to travelling. The project takes the space of the hotel, as well as particularness of this building’s history as a starting point. Artists who presented their work addressed different aspects of the project, from home, remote and experience as such, to philosophical notion of ‘investigation’. All guests needed to reserve their visiting time, an afternoon solo visit or lecture/performance/reading evening in a group. We decided to refer to the ‘audience’ as guests, trying to escape the implied passivity in the role of the audience, as well objectifying the purpose of realizing this event – for/with the guests. Also, we created a situation in which the community of hotel guests, strangers, and travellers was intruded/invaded by people who live in Rotterdam or Amsterdam, by the domestic ones. Would you like to travel to your own reality? The invitation to the event was intentionally vague and thus the possibility of anticipation of what was to be expected was limited. The actual experience of here and now became essential. The afternoon visits gathered from 1 to 4 people at the same time in the space. 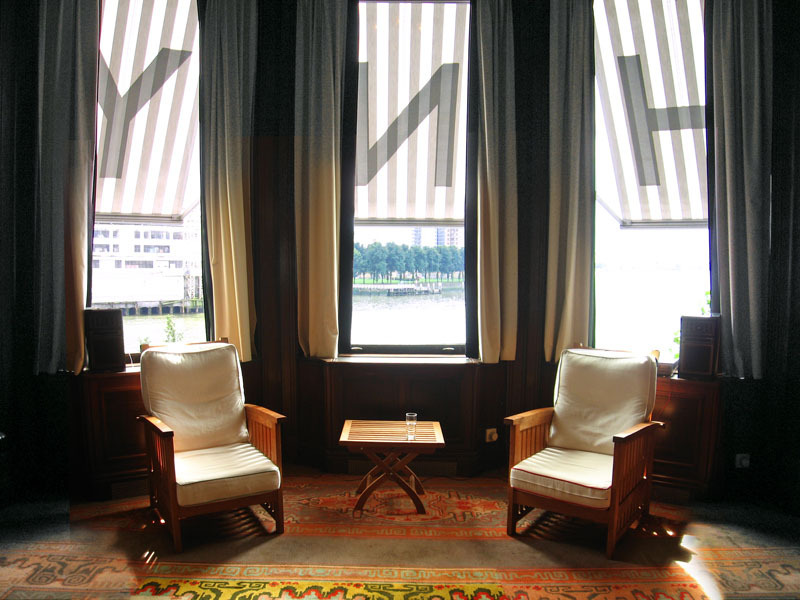 “You have just entered the Hotel New York Conference room that used to be an office of transatlantic shipping Holland America Line. The afternoon visits were by no means documented. The evening programme gathered not more than 24 people, including three of us (a hotel policy). On her way home from the second evening, Gunndis’ fantastic amplifier fell off bicycle and broke. Most of the staff needed for the two days was transported in our biggest travel suitcases. You have just been to Rotterdam. Today could have been Sunday, 1st July 2007, little past 16.30.